“What’s your favorite subject in school?” This is one of the standard questions asked of school-aged children, and the answer is often recess or gym. The popular response can make parents cringe, but studies have shown that gym and recess are crucial to healthy child development. 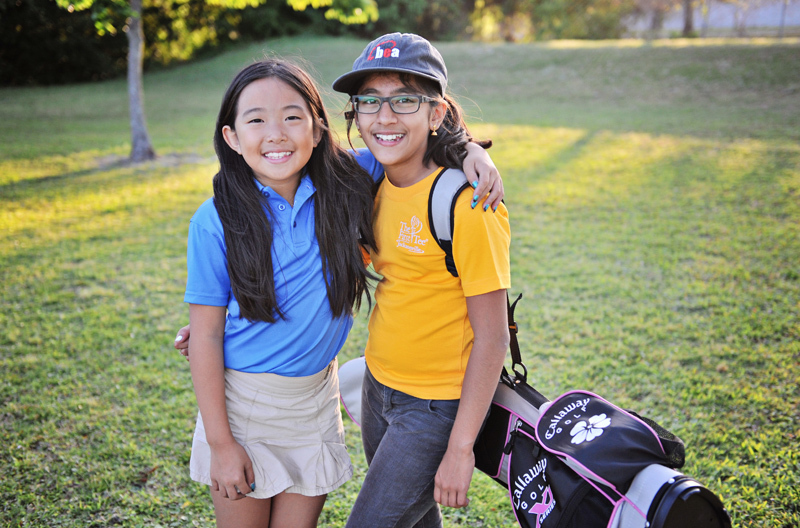 Sports-based youth organizations The First Tee and Girls on the Run understand the need for kids to break out of the structured school routine. 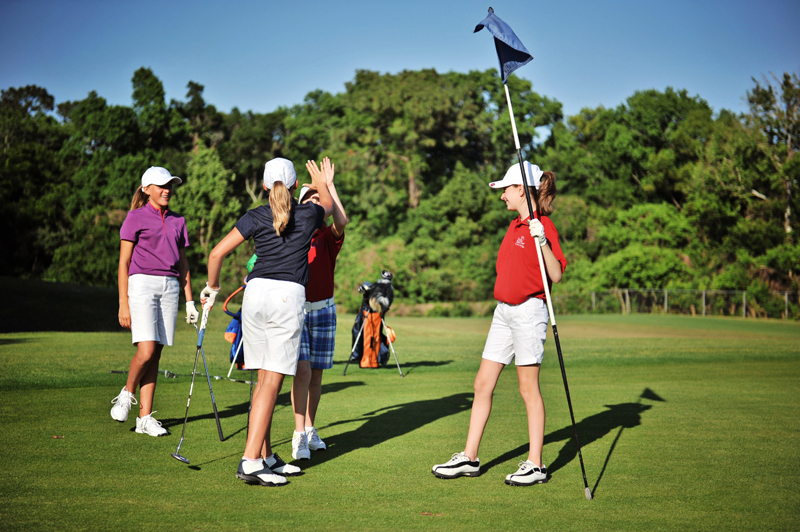 Through the power of golf and running, extracurricular programs teach adolescents to master sports skills along with life and leadership skills in a fun, supportive, and challenging environment. With active chapters in the greater Mercer County area, The First Tee and Girls on the Run are gearing up local youths for a lifetime of health. In 1996, Former Ironman Triathlete Molly Barker founded Girls on the Run in Charlotte, North Carolina to create a space where adolescent females could avoid what she calls the “Girl Box.” According to Barker, young girls often go to this proverbial box when they start listening to social and cultural stereotypes more than themselves. 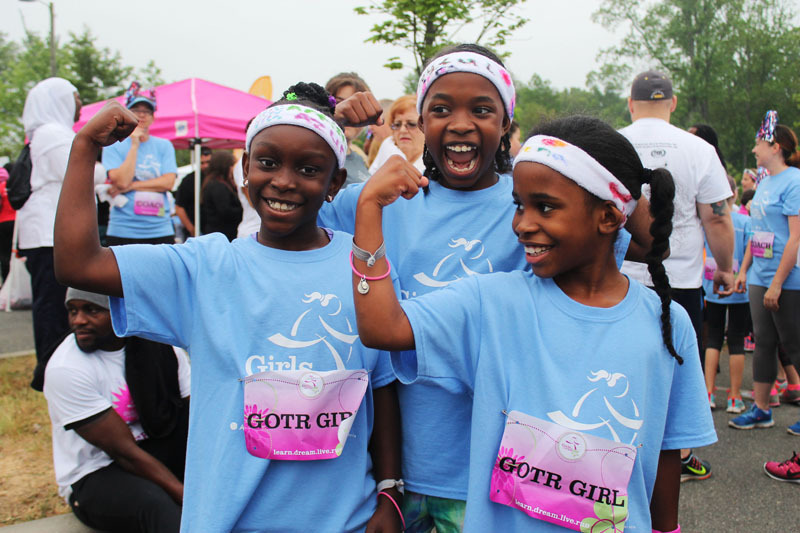 The Girls on the Run organization tries to break down these barriers through conversation-based curriculum and running activities that teach girls to be confident women who are mentally and physically strong. Over the course of three months, girls who are eight to 13 years old participate in a 20-lesson curriculum designed to help them better understand themselves, their relationships, and their role in society. 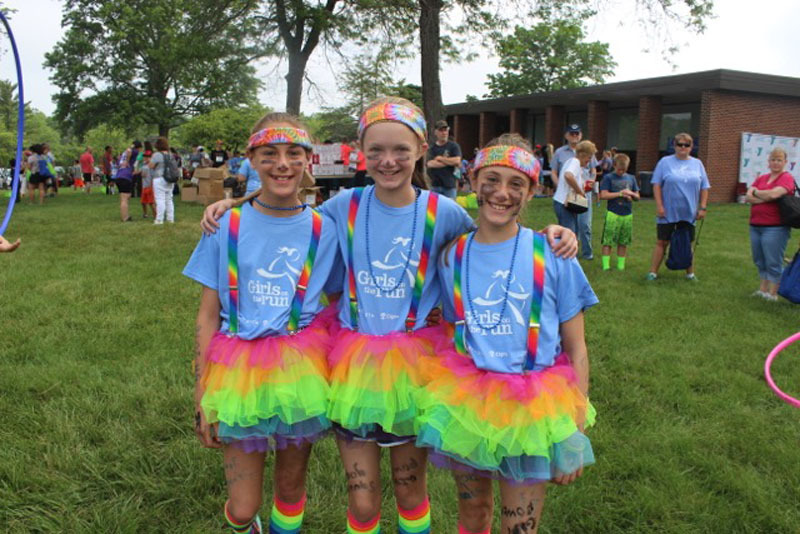 The non-profit organization is divided into two programs: Girls on the Run for girls in third to fifth grade and Heart and Sole for girls in middle school. Each is designed to address challenges particular to that age group, and both programs culminate with a celebratory 5K that embodies the participants’ ability to meet any goal. Come 2016, more than one million girls have participated in the transformational learning program that’s facilitated by over 100,000 volunteers. In 2015 alone nearly 200,000 girls joined one of the Girls on the Run councils, which can be found in 227 cities across North America. That led to more than 350 end-of-season 5Ks, making the Girls on the Run 5K series the largest in the country. The North Jersey East chapter of Girls on the Run has a total of 70 sites, with 13 of them in Mercer County, and four in Princeton. 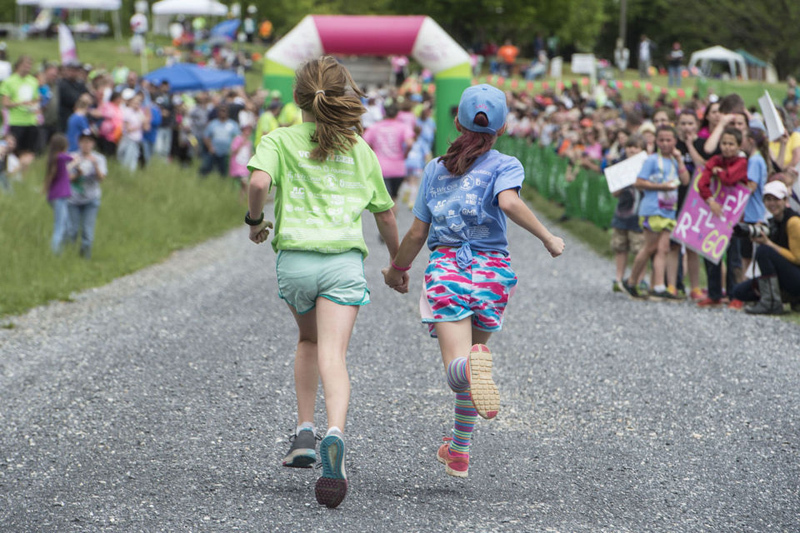 In accordance with the international Girls on the Run format, twice a week during the spring and fall, the fields at Community Park North, Littlebrook Elementary, Stuart Country Day School, and Princeton Day School are full of young girls running in pursuit of their goals. Actually, the girls might be running, walking, or simply moving towards their goals because, as Anne Klein, Program Director of Girls on the Run New Jersey East makes clear, Girls on the Run isn’t just a running program, but a self-esteem building program. While the power of running and movement is used to reinforce character development, each session focuses on a certain theme or topic. In following with the national curriculum, the coaches will facilitate a discussion with the girls on a subject such as emotions, and then conduct a related activity like a relay race or a game of tag. The final piece is the “workout,” which is more about processing the day’s discussions while interacting with teammates. Each team is composed of girls and coaches of all shapes, sizes, interests and abilities. Some are runners, and some are not, but they’re all trying to be themselves, something that the Girls on the Run community values. A developing confidence among the program’s participants also proves to be super catchy. Klein recalls several memorable moments when quiet girls started to be team leaders. Program Director and Coach at The First Tee of Greater Trenton Robert McGill sees golf as a metaphor for life. According to the former marine, current minister, and dad to three golfers, “It is a sport that you can line up side by side with life. Every day you get up and face the same household; go to the same school, and take the same courses, but that day is never the same. Even though you’re going to the same places and doing the same things, everything changes, and there are new challenges. This is the same on the golf course. When you play a course three days in a row, it’s in the same place, but it could be raining, hot, or windy. You might not get the same results as the day before, but you’re up for the challenge each time you go out.” Like McGill, the nonprofit organization The First Tee (TFT) believes golf not only teaches adolescents to tee off, but to succeed both on and off the green. Founded in 1997 by the LPGA, Masters Tournament, PGA of America, the PGA Tour and the USGA, The First Tee is a national initiative to bring the game of golf and its basic tenets to adolescents of all backgrounds. Come 2016, there are approximately 171 United States chapters and three international chapters in 1, 090 program locations including The First Tee of Greater Trenton (TFTGT). Serving youths throughout Mercer County, the local chapter holds weekly classes year-round at Princeton Country Club, Mountain View Golf Club in Ewing, and Stonybrook Golf Club in Hopewell. In keeping with its mission to teach character development through golf, TFT is based on nine core values connected to the sport: honesty, integrity, sportsmanship, respect, confidence, responsibility, perseverance, courtesy, and judgment. Called the Life Skills Experience™, the national curriculum is delivered to TFT participants through more than 20,000 volunteers and 2,900 coaches. Participants are placed in one of five levels of the Life Skills Experience depending on their age and understanding of the value and golf skill taught at each stage. The program’s youngest participants are placed in the “PLAYer” level where they are introduced to The First Tee Code of Conduct and the game of golf. Those who are ready to take an active role in the community and create their own education, career, and golf goals can advance to the highest tier, “Ace.” A certification can be obtained at each level to demonstrate the participants’ understanding of what was taught, which allows them entry into the next level. Mastering golf is no easy task, but it’s simpler to explain a technical skill like putting than an abstract concept like conflict-resolution. Knowing this, the TFT coaches often use the golf course to explain such complexities. For example, bunkers can represent obstacles youths face and how to maneuver around them. Depending on the session’s written curriculum, golfers might learn how to “blast out of the bunker” on any and all courses in life. Open to five to 18 year-olds, the TFTGT’s concrete examples prove particularly helpful to their younger players like nine-year-old Ezra Broomer. While the skills taught through the curriculum are beneficial in various areas of life, research has shown that they translate particularly well in the classroom. According to TFT’s website, 73 percent of its participants reported high confidence in their ability to achieve academically. This comes as no surprise as TFT conducts its classes much like those in a school. In addition to end-of-session certification testing, TFT assigns weekly homework for students to complete in their yardage books that relate back to the lessons learned. Seeing the strong influence its program has on education and learning, TFTGT has created additional channels to extend its reach to more adolescents. TFTGT has worked closely with area schools such as Daylight Twilight Alternative High School in Trenton and Nottingham High School in Hamilton. A testament to the program’s enduring effects on its students, a female TFTGT graduate from the Lawrenceville Prep School spearheaded an effort to start a First Tee mentor program at her school. Approximately fifteen students from the Trenton area are matched with a mentor from the Prep School to guide them through TFT curriculum. A similar program has recently been launched out of the Pennsbury Racquet Club. With its offices located in the Trenton YMCA, The First Tee of Greater Trenton and the YMCA make a concerted effort to reach the adolescents from their home base. Registration for Girls on Run is ongoing until two weeks into the start of the fall season on September 12, 2016 or until all spots are filled. For more information on the program visit www.girlsontherunnj.org. Online registration for The First Tee of Greater Trenton is now open. For more information or to sign up, visit www.thefirstteegreatertrenton.org or call (800) 322-4352.